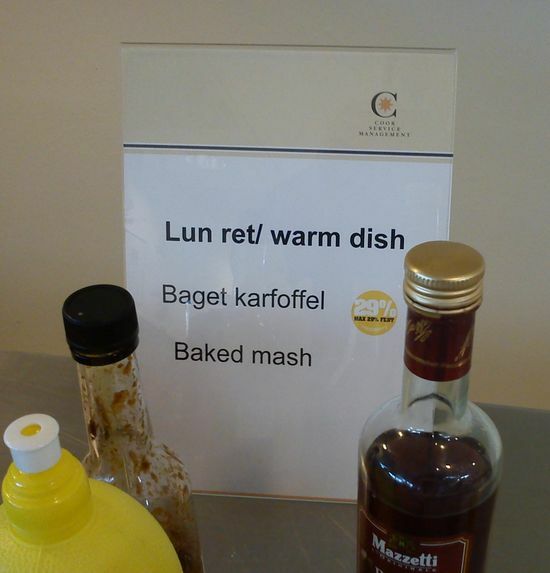 You may by now be familiar with the unintentionally entertaining signs our canteen puts up every once in a while. Today I bring you yet another look into the way canteen staff’s confusion manifests itself. Yesterday’s warm dish (aside from the main dish) consisted of a bunch of baked potatoes. They were whole, one-piece potatoes. You may know a whole potato to be the opposite of a mashed potato. It’s like someone ran an English recipe for “mashed potatoes” through Google Translate and figured that he “mashed” part was plural for “potatoes”. Continuing that train of thought the person concluded that “mash” must be a single potato. When you bake it you get a “baked mash”. Logic! For Danish speakers the above sign also offers some amusement, as each of the two words in the Danish part of the sign is misspelt. It says something like “bakeed pofato”. So, the meal description part of the sign consists of a grand total of four words and someone somehow managed to mess up essentially all of them. I believe the correct Internet expression for this is “EPIC FAIL”. @Daniel Nest @evy hahah. I dont even know if its funny or sad! @evy Serious duiscussion? On this blog? Over my dead body! OK I was joking…please don’t kill me! @Daniel Nest Too late. Sorry. It may have another meaning : It is baked and then you mash it…..? It could have been meant to be instructions? Warm dish? Does that mean it is hot or lukewarm? @Daniel Nest I was not using a fully loaded brain when I posted they above. @Daniel Nest Nice! Why do I come on here? Chased by your evil ninja monkeys and now being compared to your canteen staff. Thanks a lot! @Daniel Nest Not sure how to take that? The less you think about my confusing words, the better off you’re likely to be. Or…are you? @Daniel Nest It can go both ways…figure that out. I disagree. They didn’t mess up the “baked”! @LightSpeedGmng And for that they deserve our eternal respect and admiration!